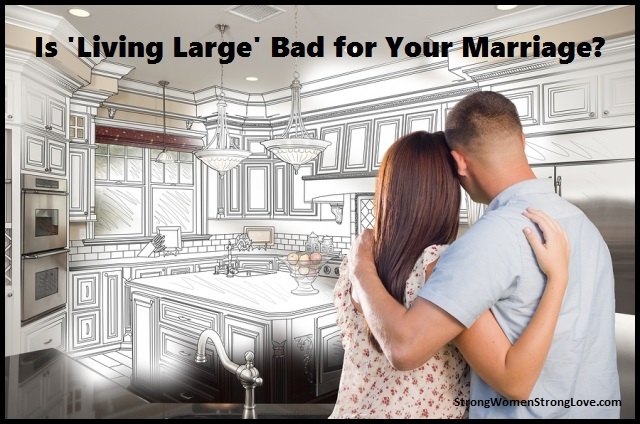 Is ‘Living Large’ Bad For Your Marriage? Maybe you succumb to it when your sister asks what you’re doing to help your teen get into a high-ranked college. Or when your friend shares pictures on Facebook of the dream vacation your family can’t quite afford. Maybe photos of beautiful decors on Pinterest have you looking at your own house with critical eyes, or an upcoming class reunion makes you wish you had more career successes to brag about. There’s nothing inherently wrong with any of those pursuits, of course. The problem comes when we start chasing such goals without even asking ourselves whether we truly want them and how much they will truly cost us. How might the stress of trying to “go big” in every area of your life affect you? Could the high expectations that go with pursing all these goals possibly take a toll on your marriage? What turns our expectations for ourselves from a source of motivation to a source of stress? Well, some common beliefs in the United States have something to do with that tendency. In her book, The Trance of Scarcity: Stop Holding Your Breath and Start Living Your Life, coach and speaker Victoria Castle writes that most of us living in American culture have internalized the story: I am not enough. There is never enough. If that story is something you feel at your core, nothing will be enough to fill that sense of lack. You’ll be constantly heaping new expectations on yourself. Then there’s our culture’s belief that you can do anything you set your mind to. The simple truth we often ignore, though, is that everyone has physical, emotional and financial limits. Your energies and resources are not infinite. Now throw in the push to compare ourselves with others thanks to the never-ending barrage of images on social media. “Why does it look so easy for everyone else?” we wonder. And then we push ourselves even harder. Feelings of scarcity, a belief that we should be limitless, and constant comparisons with others are a perfect recipe for ongoing stress. And as you already know, being stressed only makes a marriage harder. When both of you constantly feel pressured to keep up with outside standards, it really makes it harder to keep the focus where it needs to be — on each other. You may think that the happiest marriages are between people who have somehow figured out how to do it all and have it all. Not true. Instead, the most satisfied couples get clear on what’s important to them. They step away from external pressures that don’t fit the life they want to create. And they make their marriage a priority, even when taking time for their relationship means they have to let go of some of the things they’re supposed to do or have (but that ultimately aren’t as important to them). These couples haven’t escaped from pressure and expectations. But they can better weather them because their relationship gives them a strong center. And they don’t necessarily have tiny, circumscribed lives. The difference is they respect their limits and get added support when they need it. A marriage does not remain healthy and survive hardship by chance. 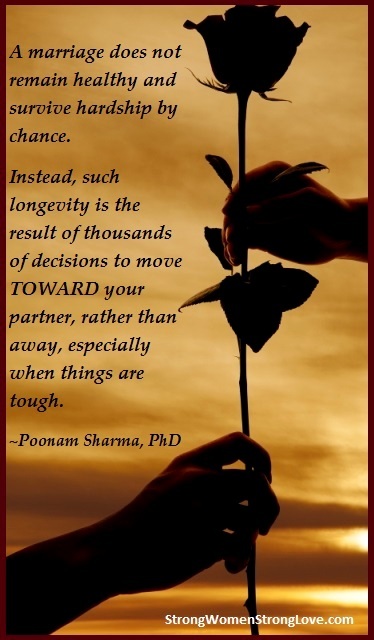 Instead, such longevity is the result of thousands of decisions to move toward your partner, rather than away, especially when things are tough. We’ve talked before about the toll that stress can take on your relationship. Now, let’s look at a few ways to relieve stress to improve your marriage. 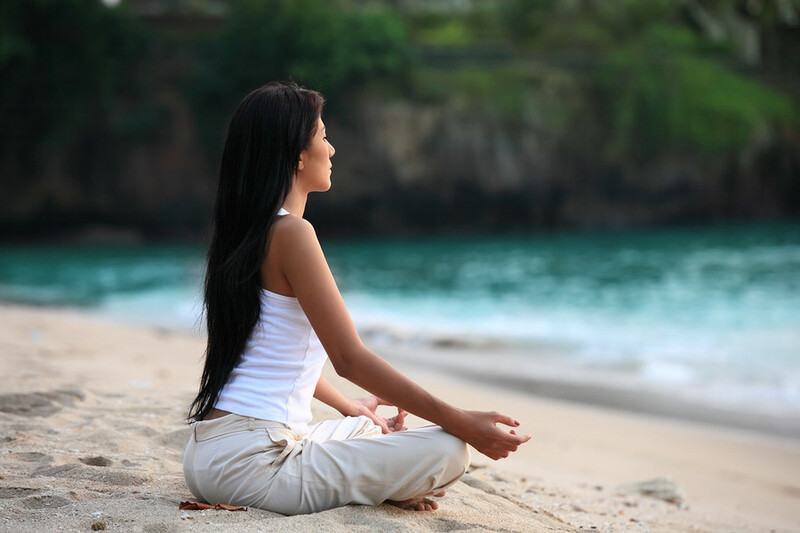 Are you so busy that you neglect the fundamentals of self-care? If you regularly skip meals, skimp on sleep and fail to drink enough water, that can leave you feeling pretty lousy, and may bring out your worst self in your marriage (and your career, your parenting, and on and on). Move these healthy habits higher on your priority list. Even 30 extra minutes of sleep can do wonders to ease stress. And when you’re less stressed, you’re truly able to be more present in your life. We can only do so much. Limits are nothing to be ashamed of; they are simply a reality of our existence. Constantly pushing past our limits makes us more vulnerable to relationship problems, illness, overeating, and addiction. What can you take off your plate? Do you have any perfectionist standards that you can relax, even a little bit? Lowering the demands on you will open breathing room for your marriage as well. 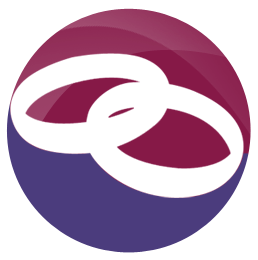 A strong marriage buffers stress and protects your emotional well-being. But for most couples, there is simply less time to spend together after becoming parents, and we lose some of the stress-relieving benefits of this intimate bond. If you never prioritize your marriage, you put it at risk –and that is not good for you or your children. Even if it is brief at first, schedule time alone with your husband to keep the connection between you strong. Did you know that the average U.S adult has only two people they can talk to about the most important things in their life, and one of them is probably their spouse? That’s too much pressure to put on your marriage. It’s easy to neglect our relationships with friends and family amid the busyness of daily life, but we need them. Do something to reach out this week. Is there a friend you haven’t talked with in a while? Give her a call. Remember that even when you feel boxed in by daily demands, you can still make choices that start to ease the pressure and simplify your life. Lowering overall stress is a process that can take some time, but will ultimately yield rich payoffs in your marriage and beyond. What small step can you take today to start lowering your stress level? Families typically struggle to maintain some semblance of work-life balance. In most cases such balance can never be achieved and is a tremendous source of strain on a marriage. See how this article from The Huffington Post describes an amazing employer’s innovative approach that results in a win-win for everyone! 1) The subsidized cafeteria includes a kids’ menu with hot dogs shaped like octopuses. SAS encourages parents to have lunch with their kids. The children are walked over from the on-site subsidized day care that is also offered. Eating lunch with your kids helps workers stay connected to them during the work day. Plus the kiddos get to see where mom and dad go every day, because they go too. As for the hot dogs shaped like octopuses, we are told the cafeteria takes the extra step to splay the ends and create the octopus look. Presentation matters, you know. As for those employees who would prefer not sharing lunch with the little ankle-biters, there are plenty of other dining options. SAS has four on-site subsidized gourmet cafes, coffee bars that serve Starbucks; there’s a free breakfast every Friday, and fresh fruit is delivered to all break rooms on Mondays. There are free snack and drink stations on every floor. The cafes also cater and can whip up a nice last-minute birthday cake to take home to your room-mate. 2) Can you count to 37.5? That’s the maximum number of hours SAS wants you to work in a week. 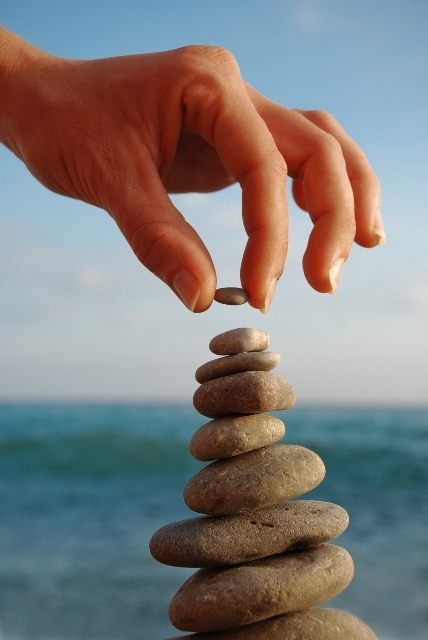 SAS is big on work-life balance and puts its money where its time clock is. It is staffed to a level so that people aren’t routinely working late or long. Sure things come up and you might have to work on the occasional weekend, but just adjust your schedule and keep it to 37.5. Flex time rules.